Tourist cars on the Isle of Skye fill up the side of the road as the nearby Old Man of Storr visitor car park is full. 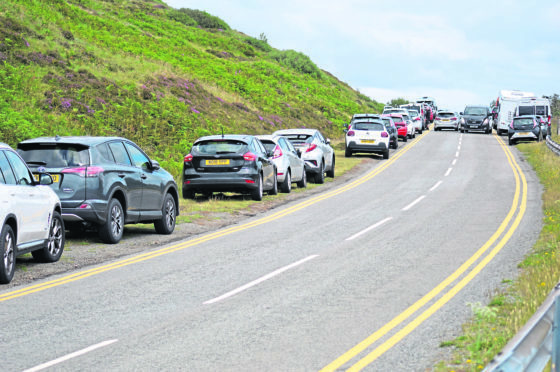 Visitors to Skye were left astonished as the volume of traffic at one of the islands beauty spots caused parking pandemonium. Martin Mann and his wife Irene stopped off at the Old Man of Storr whilst visiting Skye and found parking facilities around the tourist attraction in a state of disarray. Mr Mann said: “Cars were abandoned everywhere for miles in either direction. There were one or two small car parks which were obviously full. “Double yellow lines have been painted along the road verge. “But drivers seem to believe that it’s ok to park on what’s left of the verge on the ‘inside’ of the double yellows. “As far as what can be done about it, I’d venture to suggest nothing would help. The disorder in parking comes as the island looks likely to be plunged into further chaos after the Co-op announced it would be closing the islands only 24 hour petrol station for a three month period to carry out refurbishment works. Modern and more efficient pumps are set to be delivered to the courtyard at the Co-op store in Broadford, with work set to begin towards the end of August. The move leaves locals and visitors with the conundrum of fuelling up in Kyle before entering the island or waiting until Portree, 35 miles away. Local businesses now have the added pressure of ensuring adequate fuel is sought in order to carry out their day to day routine. Hugh Ferris, operator of Skye Distillery Tours, said: “It is more of a problem for tourists as many don’t appreciate there isn’t a garage for 30 or 40 miles. “Some are already passing garages and still running out, so if you take away one of the main filling stations it has the potential to cause issues. “In terms of the tours, we will just have to make sure we fill to the brim at every opportunity. Councillor John Finlayson said: “Ongoing discussions continue to take place between the council, other public agencies and communities about the need to support infrastructure that is used by locals and tourists alike. “In the last year investment has been made at Neist Point, The Quiraing and Fairy Pools and other works are also planned at other sites, including the development of parking at the Storr. “The biggest concern for communities continues to be the state of many of our roads. Councillor Finlayson added: “I feel the Coop should have considered the implications of closing the major petrol outlet in the south end of Skye.